Formula One is marking a very special landmark this week at the Chinese Grand Prix, the sport's 1000th race. Lewis Hamilton and Sebastian Vettel are set to do battle in Shanghai, but F1's modern day superstars are following in the footsteps of several greats who set benchmarks along the way. Who has won the most F1 races? Who has entered more than any other? Which GP has settled the most title races? We answer all of those questions and more as we look at the Opta numbers behind the competition's 999 races to date. 69 - Italy and Great Britain have hosted more races than any other countries, each appearing in every F1 season from 1950 to 2018. 68 - Of the 69 races in Italy, all but one were held at Monza. This makes it the most visited track in F1 history. The 1980 Italian GP was raced in Imola. 12 - The Japanese GP has seen more decisive, title-clinching races than any other. The Italian GP has settled 11 championship tussles. 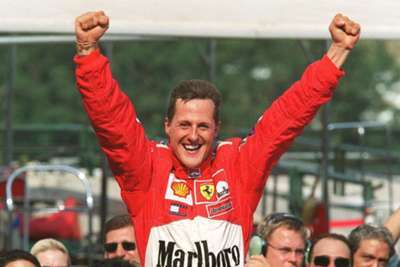 91 - Michael Schumacher won more F1 races than any other driver, with the French GP his favourite race (eight wins). 323 - Rubens Barrichello appeared in more races than any other driver, almost a third of the 999 to date. 235 - Ferrari are the team with the most race wins in F1 history, triumphing 235 times in their 972 appearances - another record. 2008 - The first F1 race to take place at night came at the Singapore GP in 2008 when Fernando Alonso won. 4:04 - The longest race in history was won by Jenson Button in Canada in 2011. With a rain delay disrupting proceedings, the race lasted four hours, four minutes and 39.537 seconds. 2 - Both Jackie Stewart in Spain in 1969 and Damon Hill in Australia in 1995 won by two laps, the biggest margin in F1 history. 0.01 - The smallest winning margin in an F1 race came at the Italian GP in 1971 when Peter Gethin pipped Ronnie Peterson by just 0.01 seconds. 248 - Schumacher averaged the fastest speed at a race in F1 history, 247.586 kilometres per hour in Italy in 2003. 24 - The race with the most finishers in F1 (24) came at the European GP in 2011. 3 - The race with the fewest finishers saw only three drivers - Olivier Panis, David Coulthard and Johnny Herbert - cross the finish line at the 1996 Monaco GP.